The Links Property tab is displayed for all objects and lists other objects that are in some way associated with the selected object. 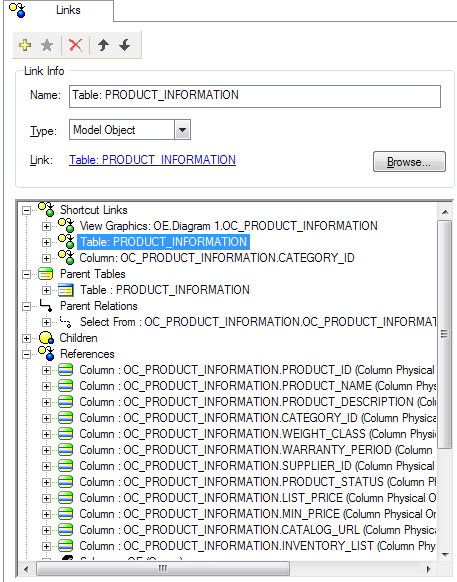 Most of the displayed objects are automatically linked via child of, referenced by, references, inherits from, or is inherited by associations. In the case of tables, columns, and relations you may also see FK (a.k.a. parent/child) associations. You can define your own "shortcut links" between the selected object and any other model object, a file, or a website URL. Keyboard accelerators (Ctrl+1, Ctrl+2, ...Ctrl+8) can then be used to quickly navigate to these user-defined shortcut links and take you to the link's target. Ctrl+9 is reserved as a shortcut link to the first parent object and Ctrl+0 is reserved as a shortcut to the first Child object. This is automatically defined for relationships - which have only one parent and child - and table and columns (which may have more than one - so the shortcut link will take you to the first one). To create a link to an object in another Diagram, link to the Model/Model Subset/Diagram/Graphic object in that Diagram. A link can also be specified as a property of an Image and Text Graphic. If a link is specified on an Image or Text Graphic, then it acts as a hyperlink - and when you click on it, it will take you to the target of the link.